Hours are weekdays, 11 a.m.-7 p.m. and weekends, 10 a.m.-7 p.m.
Reopens May 15, 2019, weather permitting. 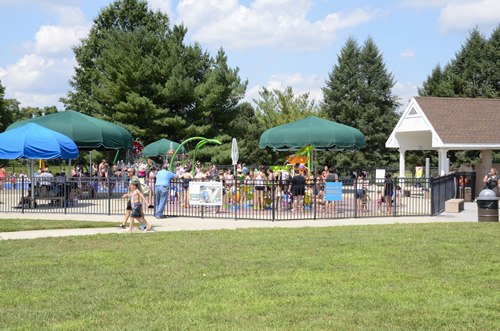 Located at the Dorbrook Recreation Area, the recently renovated Spraygound is a water-enhanced playground. Open daily from mid-May through early September, the Sprayground opens at 10 a.m. on weekends and holidays and at 11 a.m. on weekdays, and closes at 7 p.m.
During the renovation, the site received all-new spray features including: raining leaves, domes of cascading water, and a series of high to low play troughs. A new bright blue surface was installed and the pumping system was replaced for improved water filtration. 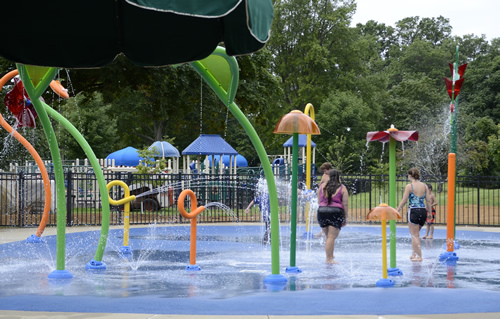 Designed to provide refreshment for park visitors and participants in Park System summer camp programs, the Sprayground is a great place to cool off and play with water. Individuals and families are welcome; organized groups are not permitted. Shower before using spray elements. Diapers are to be changed outside the Sprayground and disposed of properly. *Plastic water bottles and baby bottles/sippy cups are permitted. In an emergency, call 911. Report all accidents/injuries to the Attendant or call 732-542-1643 – Dorbrook Ranger Station. For Park System information, please call 732-842-4000, ext. 4312 (daily 10 a.m.-4 p.m.). Group outings are not permitted other than groups eligible for Spray and Play - an offering for camps and other groups serving individuals with disabilities. Please note that reservations are required for Spray and Play. Click here or call 732-460-1167, ext. 22 for more information about this offering. Garden State Parkway to Exit 109. Southbound, turn right onto Rt. 520 (Newman Springs Rd. ); northbound, turn left onto Rt. 520. Follow Rt. 520 (1.5 miles) to Swimming River Rd., turn left. Follow Swimming River Rd.to Rt. 537 west, turn right. Follow to Area. State Hwy. 34 to Rt. 537 east. Southbound, turn left; northbound, turn right. Follow Rt. 537 east to Area. State Hwy. 18 to Exit 19, Hwy. 34 north. Follow Hwy. 34 to Rt. 537 east. Turn right. Follow Rt. 537 to Area.